Convened at the Bulgarian coast of the Black Sea, the conference gathered scholars with a wide range of interests within the humanities from China through Europe to the USA and Canada. It was organised jointly by the Bulgarian Society for British Studies (BSBS) and the Bulgarian American Studies Association (BASA) in conjunction with the Alma Mater Centre of Excellence in the Humanities at Sofia University “St. Kliment Ohridski” and the Faculty of Modern Languages at St. Cyril and St. Methodius University of Veliko Tarnovo. The topic of the conference, ingeniously devised to accommodate papers on the two principle meanings of the word “letters” as graphic signs and written messages and all the space between them, gave the participants generously free licence to unfold their creativity and self-expression which everyone took due advantage of. Additionally, the conference hosted a Transatlantic Seminar on the US recent presidential elections. The conference featured a welcoming note by Ludmilla Kostova (University of Veliko Tarnovo, Bulgaria), who presided diligently over the organising committee and the smooth flow of the event, three plenary lectures by prominent scholars, twelve concurrent sessions – among which an experimental Skype panel which proved a daring but altogether successful endeavour – and an afternoon sightseeing trip to the botanical gardens and Queen Marie of Romania’s summer residence in nearby Balchik. The first-day keynote lecture by Tsenka Ivanova, Dean of the Faculty of Modern Languages, University of Veliko Tarnovo, focused on alphabets as crossroads of culture and politics. 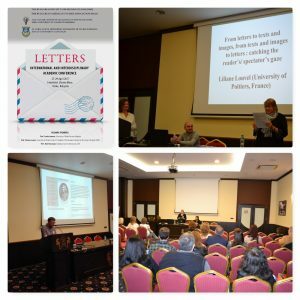 The keynote speaker on the second day was ESSE’s President Liliane Louvel (Université de Poitiers, France) who dwelled on the mediating role of letters between texts and images, exemplified by a vast array of pictorial representations from the past and present. Distinguished poet and scholar Nick Norwood (Columbus State University, GA, USA) delivered the last plenary lecture on the third day of the conference, capturing the audience’s attention with his talk on Richard Howard’s epistolary strategies. The papers, presented in the concurrent sessions, built on the plenary insights and brought the discussion of “letters” into the multifarious directions and beyond new horizons. The conference was held in the spirit of mutual respect and fruitful exchange of ideas and heated, but friendly, discussions marked especially the third day of the conference, after the joyful trip to Balchik had served as a socialising catalyst among the participants. The proceedings of the conference are to be published in the annual STUDIA PHILOLOGICA UNIVERSITATIS TARNOVENSIS series at the beginning of 2018.